Last up on the chopping block is a speaker dock from the same folks that released some of our favorite cases, Scosche. The bassDOCK is a stand for your iPad, iPad 2, and new iPad, but this is no ordinary stand, it contains a 2.1 sound system to add a nice little audio boost to the powerful tablet. 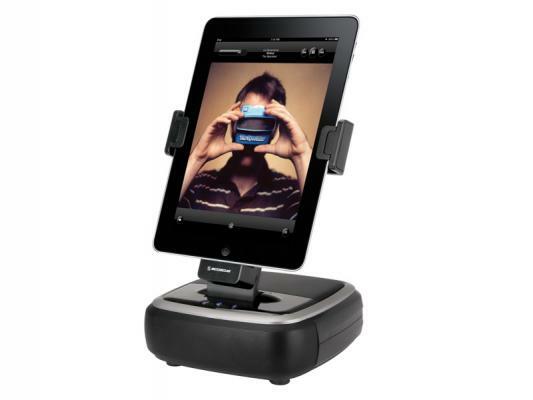 This stand is powered via AC power cord so it charges your iPad while you are using it to fill the room full of sound. 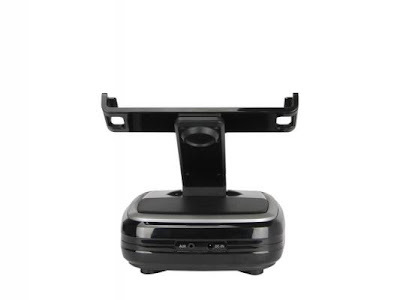 This dock does have a 3.5mm AUX port so that you can hook up your computer or non apple device when you are not charging the iPad. I have had the bassDOCK playing all day everyday for the past week and its to break it down. 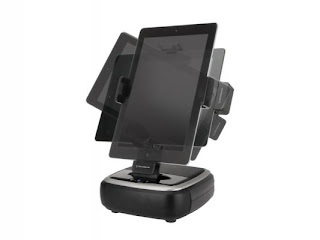 As I said, this iPad stand/charger/speaker box has been going non-stop with a number of devices providing the playlists. Along with being used by a number of devices, it has also been in all bedrooms, garage, and patio of my abode. The bassDOCK is one beastly boom box, the sound it provides is full of depth from the 3 inch subwoofer and offers loud, clear, room filling highs from the dual 1.6 inch speakers. This is also a great companion on the desktop, as my use for it is next to a 25-inch monitor to play music and movies next to my screen with great sound in my office without looking out of place or cluttered. This is also a great companion for the app, djay, as you get your iPad elevated above the dock in landscape view while going to town on the turntables. The volume get loud on this box as the highest I have taken the volume is to about 60 percent and it was loud enough to fill my back yard and was easy to hear over a volleyball game in the pool. While I loved having this around at all times and access to my entire music library using home sharing, there were some things that I would have liked seen in the finished product. My first question about to the designers is why the bassDOCK did not come with a remote that controls the volume, track, and input. 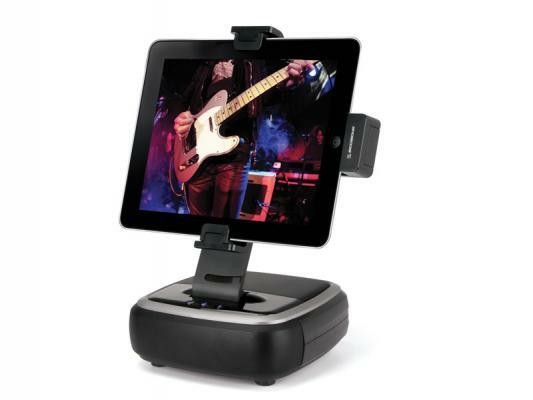 Speaking of the ability to switch to the AUX input, you are unable to do so with the iPad attached and charging, when the iPad is disconnected, the bassDOCK then plays whatever is attached to the AUX input. Finally, I wish it had come with a rechargeable battery pack, much like the Supertooth Bluetooth sound bar we previously reviewed. It limits the places in which this can be taken, luckily where this can be used, it was greatly enjoyed. Just a small remote with volume, track control, and source, make that remote waterproof and give the bassDOCK a rechargeable battery pack and there wouldn’t be a flaw to be a flaw to be found. Though there are a few things in which we would have liked to see included in the device’s production, I really could not complain as I was pleasantly surprised with the sound quality and liked how it looked on my desk.If you are someone that likes to fine tune what you hear, Scosche has an app, tuneQ which allows access to your music library and a 10 band equalizer with 9 presets.